You just never know what surprise is waiting around the corner. I was wrapping up a private consult at about 5:30pm yesterday when one of our 6pm class students arrived and informed Shirley that there was a dog in a carrier halfway up our driveway. Since our drive is about a half-mile long, there’s no chance this dog crate bounced out of the back of a passing pick-up truck; someone must have left her there deliberately. PPaws apprentice Jenn Rutter and I hopped in my van and drove down to investigate. 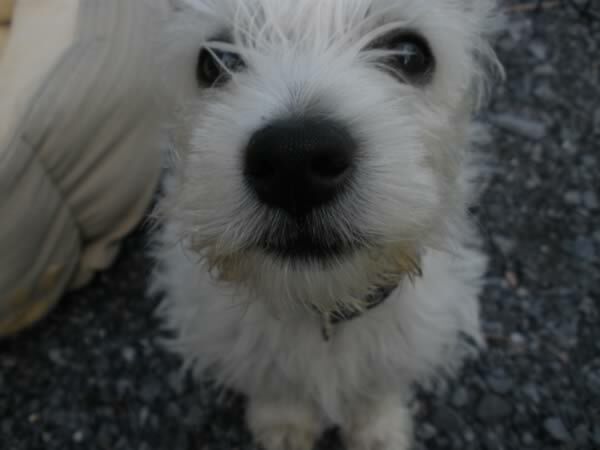 We found the world’s most adorable 12-week-old Westie pup in the world’s flimsiest soft crate, set off the side of the driveway in the grass, in the shade. Along with the pup, the owners left a dog bed, toys, food, a plastic food/water bowl, and a six-page letter explaining in great detail how much they love Maggie Faith and how much it hurts them to give her up, but because of her “serious behavior problems” they simply couldn’t keep her. Of course I scooped Maggie up and took her back to the training center, where I sat down to read the whole letter. As I slogged through it I wondered what horrible behavior problems could possible be hiding in this wonderful, friendly, outgoing, adorable pup. The first clue was when she expressed her admiration for the Monks of New Skete. “Ah,” I thought. Punishment.” She mentioned a 3-year-old child, and I went to “punishment for puppy nipping.” When she castigated the breeder she got the pup from for keeping puppies in crates, I thought “housetraining.” And sure enough, she’s convinced this pup is aggressive and can’t be housetrained. Then she says “It’s gotten progressively harder to handle.” Why am I not surprised? Of course, anyone who knows me knows that I work closely with shelters and my husband is the director of the Humane Society of Washington County here in Hagerstown. So the first thing we did was call to have an officer come pick her up and transport her to the shelter, where she is now, safe, warm and well-fed. So, in short order, Maggie will be ready to go to a Gold Paw foster home. And, of course, I’ll keep you posted here on her BMod progress. PS – If anyone happens to have any information who might have dropped Maggie off in our driveway, please feel free to let me know. Absolutely unreal. Thank goodness they left her at YOUR house, but it’s too bad they didn’t drive to the end of the driveway and get a consult! When will people realize that following dominance-based “training” methods is downright abuse? That poor little thing! Her owner had enough of a clue to dump her in your driveway, why didn’t she have enough of a clue to consult YOU for training advice? I just can’t imagine concluding that a twelve WEEK old puppy is aggressive and impossible to potty train… hopefully her life is quickly turned around. We’re going to do our best! I hope you’re able to talk to the owners before they’re successful in finding another non-aggressive, perfect puppy; a search I sadly imagine they’ve already begun. Such a cutie – Maggie Faith looks like the perfect emissary for the Gold Paw program!! What a cutie! And what a horror story for the poor puppy! Those former owners did not have a clue about puppy behavior or training! Another Milan victim. At least they dropped her off in the right place, but what chickens they were, to drop her off rather than coming all the way down the driveway to ask for help. Keep us posted. I wish you were closer! 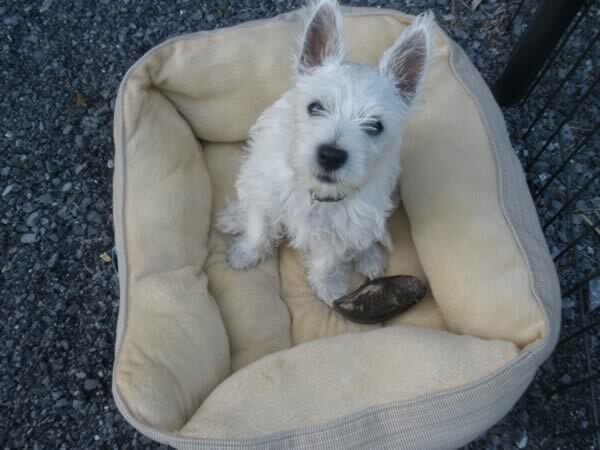 I would have been ecstatic to get a Westie – puppy or otherwise! And so would my little Havana Chica from Cuba. 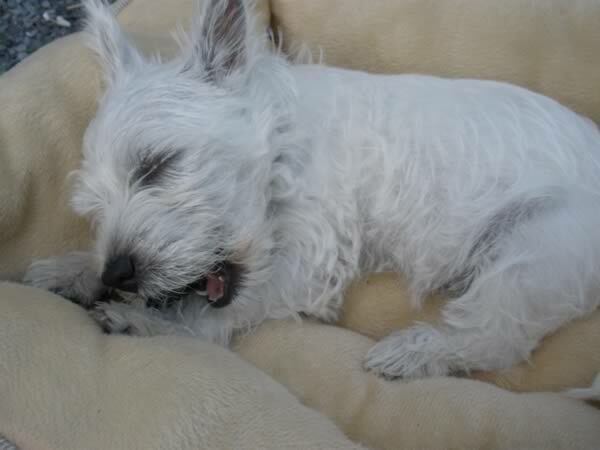 She misses her Westie friends who live in the USA. All the best with little Maggie Faith! Thanks Cassandra – I expect she’ll be fine. What always surprises me is how tenacious the owners are about an approach that clearly isn’t working! It seems that they often get set on the first approach to dog training that they become aware of…and then never let go! Even when it is not a good fit, and things are not working out as they planned, they are reluctant to look at other theories. Yes – that’s also old-fashioned training mindset. If it’s not working, do it harder. If it still doesn’t work, there’s something wrong with the dog. With modern positive training, if it’s not working, try something else.